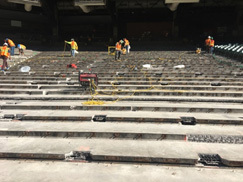 Most large athletic stadiums are constructed using precast concrete tread and riser assemblies bearing on steel beams. Cast-in-place columns typically support the beams. Smaller stadiums can also be constructed in this manner, or can be constructed with concrete bearing on the ground. 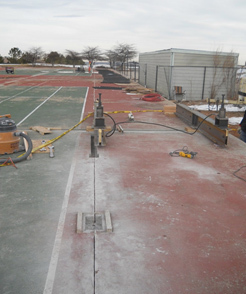 Most stadium concrete and structural repairs occur at typical locations. Following are examples of these typical locations. The examples give direction on which areas to inspect, as well as provide repair and protection measures that, if taken, will help prevent reoccurrence. 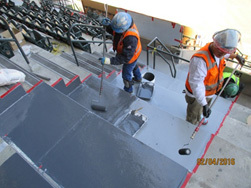 Joints are placed in concrete stadium structures to allow thermal movement and prevent cracking. Precast systems have many joints between the various concrete pieces. Control-joint caulking should be inspected and replaced at regular intervals to prevent water from penetrating the joint and washing out soil for on-ground concrete. Stadiums are washed repeatedly and water will run through poorly maintained joints. 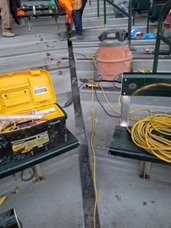 Worse yet for these stadium structures, the water washing will start corrosion of the steel support beams and steel connections. 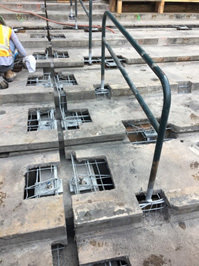 In addition, larger expansion joints should be inspected since structural pieces, also subject to corrosion, are located nearby. 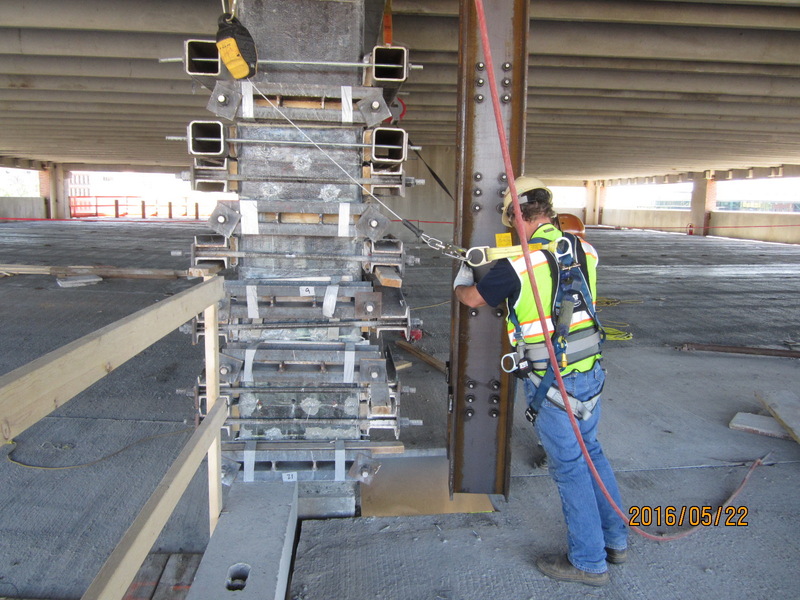 Timely replacement of the expansion joint gland can minimize future structural repair costs. 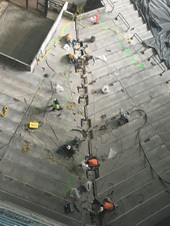 Many stadium concrete connections are buried in the concrete. However connections across joints are also common. Repeated wetting and drying cycles from washing initiates the metal corrosion process. Inspecting for similar concrete cracking patterns at specific intervals can indicate potential connection locations and possible connection corrosion. Referencing original construction drawings can provide connection interval patterns. Removing concrete or caulking to inspect embedded connections will reveal the extent of corrosion and allow the structural repair. If you determine there is connection corrosion, act soon to repair and protect the locations from further water ingress. 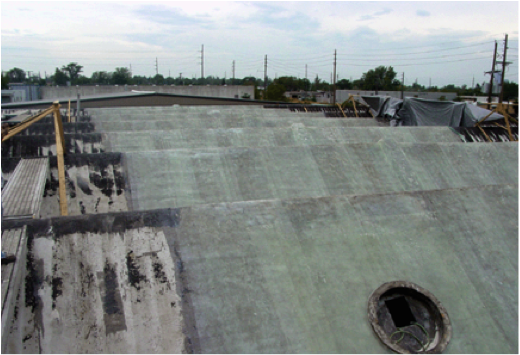 Halting corrosion will extend the life of a structure and prevent future repair costs. 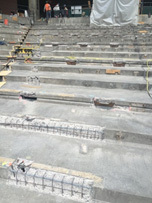 Most stadium concrete has embedded rebar for reinforcing. The wetting and drying cycle will start corrosion. 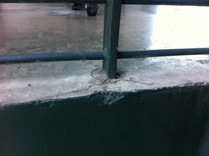 This can lead to cracking, thereby necessitating both stadium concrete repair and post-repair protection measures. 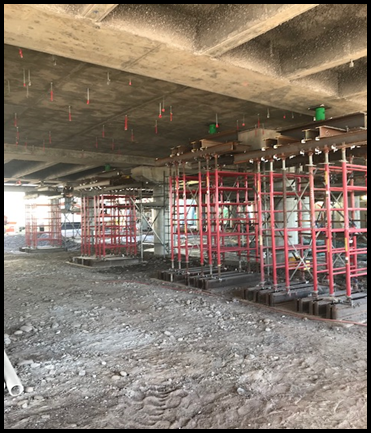 Repair consists of: removal of the unsound concrete; cleaning the reinforcing steel; typically coating the steel; and installing repair concrete. Protection systems like spray-applied sealers and waterproofing systems will help to avoid additional corrosion from the washing operations. Concrete cracking at the handrail embedment is a sure sign of corrosion. Cracked concrete can be a safety hazard and should be addressed. 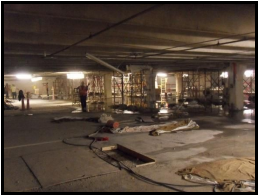 This process involves removing the cracked concrete, cleaning the area, and installing repair concrete. Consider protection or changing the embed detail to prevent future repair costs. Inspect annually and act quickly. 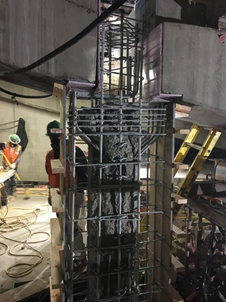 Working with Restruction Corporation to plan repairs, usually completed off-season, will prevent large scale, expensive fixes in major structural elements like support columns. Call us for help with extensive structural improvements and/or assistance with preventing these types of repairs.